Japanese art – they’re traditional at heart, but terribly awkward. A magic blend of wonder and spirituality, of art and sacrifice, of powerful messages about a hilarious, but quintessential testimony of Life. It is one of those films that you should enjoy two or three times before you understood the story and characters individually. 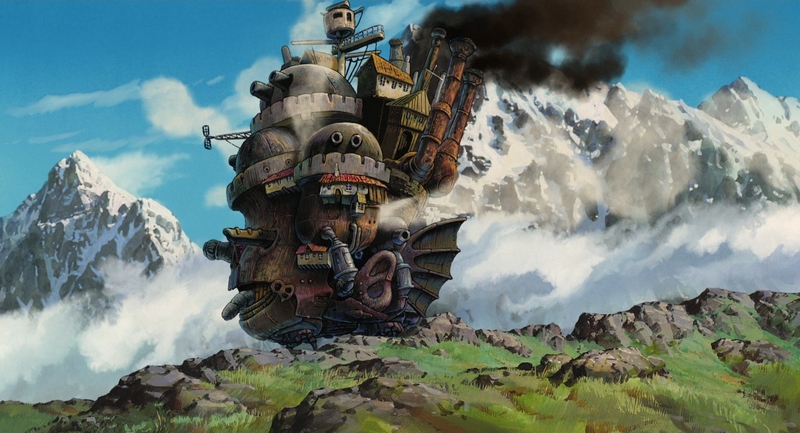 The 2004 film of the great writer and director Hayao Miyazaki is a Japanese visual masterpiece, with opulent details that catch the eye in meaningful and playful appearance besides animations’ social purpose. Despite his obvious inclination for spirituality, the movie doesn’t excel in narrative, as we had expected after “Spirited Away”. But the fascination aroused by the spectacle of visual effects and vivid colors will fix us more comfortable in the chair until the end. We meet Sofie, an 18 years old romantic working in a hat shop, meditating unhappy about the true meaning of life. Weak and humble, falls prey to sexual harassment of lecherous men at a street corner. Her Savior appears unexpectedly in a vain and seductive image of Howl, a young wizard which has his home in a castle resembling an ugly creature on four legs, which hissed in all joints. Their meeting magical announces the smehow predictable romantic thread of the film. The plot is woven with Sofie’s transformation into a fat old lady of 90 years – recurring character in animation writer – the Witch (Witch of the Waste). What I appreciated immediately was the maturity of the characters and their life lessons and the classical duality between appearance and essence, which appears everywhere. All classic Miyazaki’s films had the idea that good and evil resides in each of us. There are no good guys and bad guys, and the movie is not a cartoon for children. Aware of transformation, Sofie prefers resignation and despair instead seeking rational cure that wuld bring her to normal. Aided by a scarecrow to enter Howl’s castle, befriends the residents of the house, like fire demon, Calcifer, a slave to Howl, and Markl – door bearing protector who take visitors into other worlds and dimensions. Sophie makes a pact with the spirit of fire – very intriguing character and vital to the end of the film – to help find a cure for aging, in exchange for breaking the pact made with Howl, the mystical castle owner. We see Sofie going through terrible challenges which transform this beautiful girl’s uncertainty and romance into wisdom – a strong surprise and a life lesson for gorgeous young audience so obsessed with youth, at the expense of other horrors of life. From here, things get complicated so much that you get tangled into the ambiguous relationships of the characters from this bizarre kingdom where a nasty witch queen leads a senseless war (political and social context made this film incomplete). We admit, the ongoing different worlds and the fragmented war started by Howl’s childhood make a narrative line difficult to digest and it’s almost impossible to invest emotionally in characters. On the other hand, the moments that the narcissistic wizard pass through are delicious. His duality is delightful: although he often gives us the impression of a guy full of himself and overwhelmed by despair and adolescent anxiety, Howl is a powerful sorcerer who tends to turn into a beast with black wings in his anguish – now, only Sofie can tame his dark side with her educated sense. Thir outbursts are fun and you’ll get to like these classic movie genre delight, innocence and unconditional love for one another, including the part in which you’ll find yourself impressed by the fact that the witch turned Sophie old out of jealousy. Besides these moments, you only have to let yourself enchanted by the magical exuberance and this amazing visual fantasy world created by the director, who has remarkably adapted Diana Wynne Jones’s novel. Miyazaki’s movie it an awesome one: with so many spiritual and psychological meanings and this purely human characters full of insecurities is overwhelming; involuntarily, you’ll want to see this complicated love story that reminds of Beauty and the Beast over and over again.